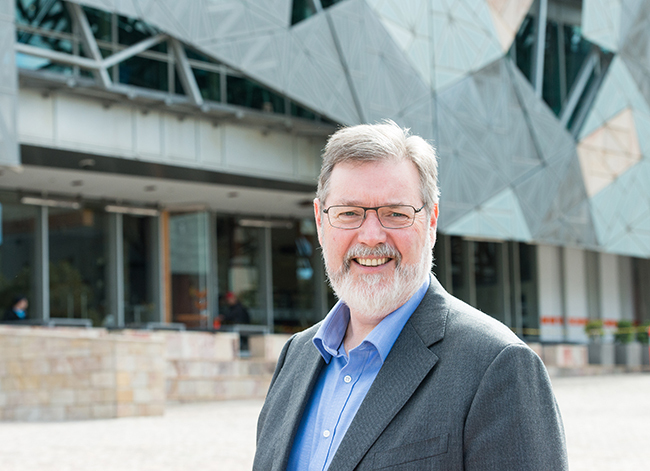 Become a leader in business through ground-breaking research and workplace innovation, with a Doctor of Business Administration from Victoria University. If you are an experienced business professional wanting to make a difference in the public or private sectors, create value, and prosper in the business environment, VU's DBA is a clear choice for you. Our study environment immerses you in the world of competitive business and new technologies, where you can explore exciting developments such as big data and human-machine interaction. You'll be part of a vibrant community of professionals, working to solve industry challenges with new ideas and research-grounded initiatives. Our strong industry connections let you network and learn from the brightest minds in government and private organisations. Take your career to the next level in one of the first degrees in Australia to combine coursework with research doctoral programs in business. The Victoria Graduate School of Business (VGSB) is located in the heart of Melbourne’s CBD, with study hours tailored to the working professional. Our after-hours adjustments put your schedule first and foremost, letting you manage the busy juggle of work and postgraduate research. We have strong relationships with the nearby business community – and leverage these relationships to give you highly relevant, practical experience and networking opportunities. Along with our expert lecturers, industry connections lend us honorary staff who provide valuable links to the financial world. One of these is the finance guru Alan Kohler, founder of Eureka Report, Australia’s most successful investment newsletter, and Business Spectator. Victoria University was the first university in Australia to offer the DBA, and has done so continuously for 20 years. The DBA is one of the first doctoral degrees in Australia to combine coursework and research in business, and is continually refreshed in line with global DBA standards. Our DBA is similar to our PhD in Business in that you will emerge with a doctoral qualification. It differs in that it is directly linked to professional practice, with a focus on application in the workplace rather than in academia. Your study will be informed by a global context that reflects sustainable and ethical practices, contemporary business patterns and recent imperatives such as digital integration. You'll begin with four coursework units, which prepare you for your research component, whether or not you have a research background. You can then undertake research that is relevant to your career progression or your current work environment. Our Doctor of Business Administration (DBA) teaches you to use research tools to innovate, bring new ideas to the workplace/industry, and beat competitors by standing out with research-grounded initiatives. Compensation at the top level of business is typically generous. The Australian government site Job Outlook has salaries for Chief Executives and Managing Directors averaging at $134,000 (JobOutlook). After a big career change, executive manager Paul Moran took on a DBA at VU and is now giving career opportunities to VU students. 1. Contextualise and apply relevant theoretical knowledge to undertake rigorous research at the doctoral level into contemporary business problems, and contribute to original knowledge, theory and practice in business. 2. Critically review a range of quantitative and qualitative business-oriented methods to determine and adapt appropriate methods for data collection and analysis to emerging intercultural and interdisciplinary business problems. 3. Critique contemporary organisational or professional practice in the light of relevant theory, demonstrating their capacity as a reflective practitioner, scholar, leader and life-long learner. 4. Critically evaluate business research studies in order to assess their quality and applicability in improving effective handling of business problems. 5. Demonstrate exemplary oral and written communication skills relevant to translating complex research findings into business practice. 6. Identify, analyse and evaluate internal and external environmental influences on organisations in order to adapt and develop effective plans for the management of change and development, demonstrating social inclusivity, responsibility and authoritative and ethical judgement. 7. Generalise and apply creative and innovative ideas or solutions within contemporary global business environment. You will need to follow the six steps to becoming a research student. Contact the Office for Researcher Training, Quality & Integrity on +61 3 9919 4522 or email apply.research@vu.edu.au if you require further information.